Are You Letting Guilt Destroy You? Millions today are! Here's how to turn guilt into growth. He was exhausted and emotionally drained, and a tormenting thought kept racing through his mind: I fled — I denied Jesus! What a horrible thing to do! he thought. I've betrayed Him just as He said I would. I watched as He stood before the council. I listened to the lies they told and did nothing to help! How can I ever live with myself? The guilt was enormous — it penetrated the depth of his being and tortured him day and night. Over and over, it seemed he could hear the sound of the rooster's crow that brought Jesus' words flooding into his mind: "Assuredly, I say to you that this night, before the rooster crows, you will deny Me three times" (Matthew 26:34). Peter undoubtedly reached a point where he thought he could no longer stand the agony. In a deep sense of remorse and repentance and with a sincere desire to change, he cried out for forgiveness. He earnestly committed himself to fervently serve the God he had formerly denied. His prayer was heard, and not many days later, on the day of Pentecost, he displayed his commitment by boldly proclaiming Jesus to be our Lord and Savior (Acts 2:36). For Peter, his guilt bore good fruit. Rather than living the rest of his life mentally and spiritually crippled by guilt over this tragic mistake, he yielded his life to God to use for a greater purpose. What about you? How are you being affected by the guilt you may bear from dark days gone by? Is it gnawing at you, incessantly troubling your mind? Or have you pushed it to a dusty corner of your mind in a futile attempt to ignore it? Is it leading you to forgiveness and growth, like Peter, or is it causing you to feel worthless and rejected, or making you fear that punishment ominously looms over you? Tragically, unresolved guilt causes some, like Judas (Matthew 27:5), to suffer the ultimate destruction — death. Let's be honest and face the facts. Guilt can have positive or negative influences on your life. The choice is up to you. Guilt results when one fails to perform to a standard of conduct. But sadly, many bear needless guilt because they are living by the wrong standards — the product of Satan's deception. This treacherous and subtle fallen archangel has led man to lean to his own understanding rather than God's (Proverbs 3:5) — to determine for himself what moral code, if any, he chooses to live by. 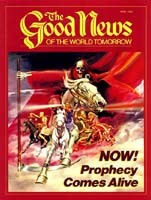 Satan has deceived the whole world (Revelation 12:9)! Human traditions and vain intellectual reasoning have all but replaced God's laws, the true standards (Mark 7:7-13). For that reason, many feel guilty because they have merely fallen victim to circumstances beyond their control — not because of violation of a spiritual law. For example, why should you feel guilty because of hereditary limitations you can't change? Is it your fault you may not be as healthy or as attractive as some others are? Should you feel guilty if you stand up against the negative influence of peer pressure? Why should you bear guilt if, after putting forth your best effort, you fail in business or a sporting contest? Should you be tortured by guilt if you reject vain, human traditions and try to live by righteous standards? Of course not. On the other hand, you shouldn't go to the other extreme of so ignoring the prod of your conscience that you feel little or no guilt about violating God's clearly defined laws (I Timothy 4:1-2). Some have no qualms about lying and cheating. Others can burn with envy and jealousy and feel justified in doing so. Still others can lust, commit adultery, covet others' positions and possessions and not feel one tinge of guilt. Do you get the point? Guard yourself from reacting to the upside-down, false standards of man (Isaiah 5:20-21). Go to God's Word for the right standards (Isaiah 8:20, Matthew 4:4). Don't be victimized and deceived by faulty human reasoning — strive to live by the true, righteous principles of God. Examine — question — probe yourself. Are your standards really God's standards? Or have you been subtly deceived by human tradition s, faulty reasoning, wrong emotions, the well-intentioned advice of other people — all of which are influenced by Satan the devil (Ephesians 2:2)? You need to know! Is there any real purpose for guilt? Why does God allow you to experience it? Guilt tells you that something is wrong — that something needs to be changed and corrected. It lets you know you need God's forgiveness. Just like a fire alarm, it serves to warn and motivate you to take action that will bring positive results. But do you? Do you put out the fiery flames of sin, or do you let them spread their destructiveness? The human tendency is to avoid taking action (Matthew 7:13-14). What God wants — what you should want — is real repentance: "For godly sorrow produces repentance to salvation, not to be regretted" (II Corinthians 7:10). Repentance involves being sorry for what you did — for what you are — for the wrong ways you think — for the wrong ways you act. But more than that, it means striving to change and to live according to God's will, not your own. Look at II Corinthians 7:11: "For observe this very thing, that you sorrowed in a godly manner: What diligence it produced in you, what clearing of yourselves, what indignation, what fear, what vehement desire, what zeal, what vindication! In all things you proved yourselves to be clear in this matter." This is proper guilt that produces positive changes in your life. Are you practicing diligence, being careful to not repeat the sin? Are you engaging in clearing yourself, struggling to overcome? Do you feel righteous indignation, learning to hate the sin? Are you developing a fear of sinning against your Creator? Do you have vehement desire, an intense will to change? Are you filled with zeal, submitting to God with enthusiasm? Do you feel vindication, a need to try to make up for past sin (even though you can't do it yourself) by living righteously from now on? When you are this way — completely repentant — God will forgive you (Jeremiah 36:3). Your life will be richly blessed: "Blessed is the man to whom the Lord does not impute iniquity" (Psalm 32:1-2). King David experienced this transformation after his adultery with Bathsheba and murder of Uriah. At first, he ignored God's law, and for months his spiritual blindness continued. Finally God sent Nathan to bring David to reality. The words Nathan spoke penetrated David's darkened mind (II Samuel 12:1-7) and the wall of self-justification crumbled into guilt. His facade of false righteousness fell under the weight of God's law. David's sorrow was overwhelming. He prayed for forgiveness and a right attitude (Psalm 51:1-12). God responded by granting him repentance, forgiveness and happiness (Psalm 32:1-11). Think about this. You, like David, sin. You fall short of God's glory. You stand guilty before God. But you don't need to remain that way! You can be free of guilt and experience growth. Act on the following steps. Confess your sin. Admit to God that you failed to obey His will. Let Him know that you are sorry for your actions — call upon Him for the desire and power to change. Don't merely feel sorry because you know you must suffer the penalty inflicted by your actions. That's worldly sorrow. Even hardened criminals can feel that sorrow. Hiding from your guilt doesn't eliminate it — it merely postpones when you must face it (Luke 12:2, Numbers 32:23). In the meantime it keeps you from enjoying the many blessings that stem from a right relationship with God. "He who covers his sins will not prosper," as Proverbs 28:13 says. David expressed the right approach you should follow: "I acknowledged my sin to You [to God], and my iniquity I have not hidden. I said, 'I will confess my transgressions to the Lord,' and You forgave the iniquity of my sin" (Psalm 32:5). Admitting your guilt to God may not be easy. It may mean reliving painful experiences. To avoid the pain, many attempt to justify themselves by thinking that what they did wasn't so bad, that the other person had it coming or that they were a victim of someone else's influence. The excuses go on and on, but the fact remains. You sinned, and you are guilty. Covering it up is just self-deception! Ask God to help you honestly look at yourself (Psalm 19:12). Then admit your guilt — all of it. The pain may be intense, but it is temporarily necessary (Romans 8:18), and the outcome will be joyous if you apply the next steps in this process. When you're wrong, you must go beyond admitting it. You must change. Forsake your sin by eliminating it. Many fail here because they do not go beyond admitting their sins. Jesus made it plain to the woman taken in adultery. Her sins were forgiven, but she was not to return to her sinful ways (John 8:10-11). To do so would have been a wrong use of God's grace, His unmerited pardon: "What shall we say then? Shall we continue in sin that grace may abound? Certainly not! How shall we who died to sin live any longer in it?... Therefore do not let sin reign in your mortal body, that you should obey it in its lusts" (Romans 6:1-2, 12). God's Word is clear. You must stop sinning when seeking forgiveness. You must also submit yourself to God through baptism (Acts 2:38). For a deeper understanding of baptism, read our free booklets All About Water Baptism and Just What Do You Mean...Conversion? But what if you do slip and sin after true repentance? Is everything lost? Have you misused God's grace? Not necessarily. As long as you are honestly trying to overcome sin on a continual basis, God will forgive you for stumbling under weakness or temptation. Conversion is a gradual process — developing the very character of God is a lifelong task. So don't despair when you sin. Simply ask God for forgiveness and more strength, then follow through by being obedient. As a human you will experience many failures, even after conversion, in overcoming sin (Romans 7:14-25). God knows and accepts this. So should you. Remember: Don't abuse God's grace by not fervently trying to change. But once your guilt brings you to repentance, discard it. Get rid of it. Why hold onto it? Why let it fill you with feelings of inferiority, depression and rejection? After repentance, let unity with God replace guilt. Let your pursuit of God's Kingdom and God's righteousness motivate you (I John 1:9, Colossians 3:1-3). Of course, if you sin again, guilt should return. But be careful that it doesn't so overwhelm you that it takes your focus off your positive relationship with God. After you have truly repented, God forgives you. But you must also forgive yourself. If you have surrendered your life to God, temporary setbacks should not leave you devastated by guilt: "There is therefore now no condemnation to those who are in Christ Jesus, who do not walk according to the flesh, but according to the Spirit" (Romans 8:1). Again, don't discount the severity of your sin or guilt, but learn the lesson and move on from there to positive growth. Now look at these steps: Admit your guilt. Change. Throwaway your guilt. What do you notice? That's right. The first letter of each step spells ACT, and that is what you must do to turn guilt into growth — you must act! You must act by rejecting the wrong way of handling guilt — the way that denies guilt, that doesn't change when guilty, that holds onto guilt. This way bears bad fruit — the fruit of self-deception, stagnation, depression and rejection. You must act by accepting the right way of handling guilt — the way that admits guilt, that changes when guilty, that throws away guilt upon repentance. This way bears good fruit — the fruit of forgiveness, truth, growth, joy. Which fruit would you rather bear? You must make the choice. In your life, which will it be? "It's all your fault. You'd better change." Such accusations can make you feel guilty. But is that always desirable? Not necessarily. The reason: Your guilt may be based on a false foundation laid by someone who is using guilt to manipulate you. Let's face it. Guilt is a powerful motivation that can deeply affect your emotions and actions. Consequently, some try to instill guilt in you for their own selfish purposes. Their methods can vary from deliberate lies to unconscious exaggerations. For example, you make a small mistake, but you hear the words, "You're always making that terrible mistake!" (Proverbs 14:5). Not everyone is this way. Some do speak the truth in love. But what happens when they don't? What happens when they use deception and lies in an effort to make you feel guilty? Should you go on a "guilt trip"? Many do. They allow themselves to be manipulated. Consider this situation: A man tells the truth and another man loses his job. This other man then makes him feel guilty for being truthful. King Ahab of Israel tried to make Elijah feel guilty for Israel's problems. But Elijah replied, " I have not troubled Israel, but you and your father's house have, in that you have forsaken the commandments of the Lord, and you have followed the Baals" (I Kings 18:18). Jesus was confronted by those who wanted Him to feel guilty for eating grain on the Sabbath. He resisted by pointing to God's teaching on the subject (Matthew 12:1-7). This is the way you should be. If the guilt is false, reject it. Don't let it destroy you with feelings of inferiority and rejection. On the other hand, when you deserve guilt, accept it and change. Besides this, be sure that you don't use false guilt to manipulate others. This way you, "speaking the truth in love, may grow up in all things into Him who is the head — Christ" (Ephesians 4:15).